Handcrafted flatware with textural design. Service for 4 includes salad forks, dinner forks, dinner knives, soup spoons, and teaspoons. Since 1840, Ricci Argentieri (also known as Ricci Silversmiths) has beenand continues to beone of the most respected and renowned silversmiths in all of Europe, dedicated to producing sterling silver, silver plate, gold plate, and stainless collections with exceptional quality and beauty. To ensure that the tradition of quality craftsmanship continues, Ricci artisans apprentice under expert master craftsmen who have generations of experience, and all the artisans are trained to pay particularly attention to detail as well as to create pieces that combine tradition and contemporary styling flawlessly. Each piece of sterling silver is handcrafted at the factory in Padova, Italyfiled, polished and buffed by hand just as the original Ricci artisans did it in 1840. 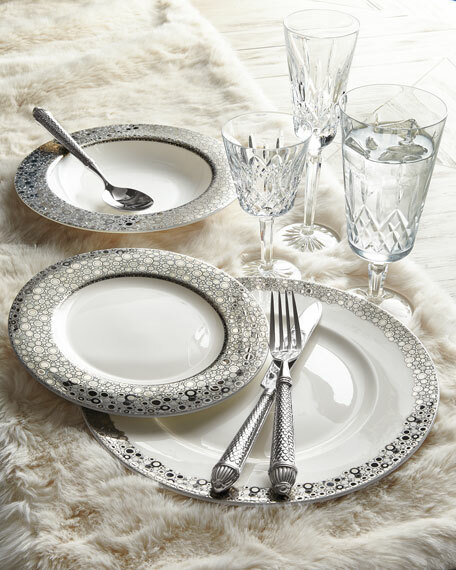 The silver plate and gold plate patterns, as well as the 18/10 stainless steel collections, are equally carefully crafted in multiple specialty factories throughout the Far East. Every Ricci pattern extends to the end of the piece and on both sides, front and back, and those pieces that are machine made are crafted on ultra-modern machinery that specializes in intricate designs. Materials, too, are of the highest quality: gold plate patterns are made using 18-kt. gold, and the stainless patterns are crafted using the highest quality 18/10 composition, creating stainless that is both lustrous and heavyweight. The knives are forged, carbon steel, and in most cases have two-piece hollow handles. 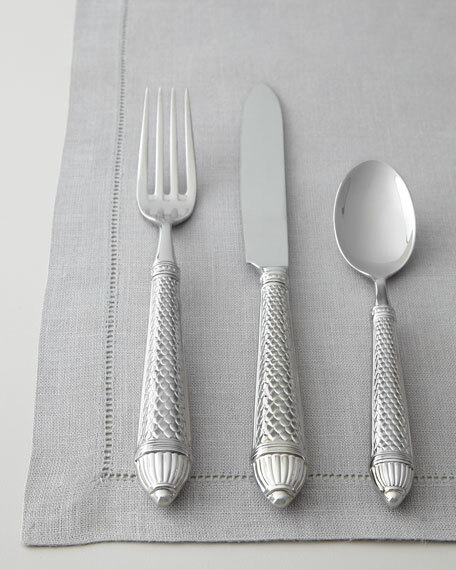 Finally, before leaving the factory, every shipment of Ricci flatwarewhether in sterling, silver plate, gold plate, or stainlessundergoes a comprehensive and stringent inspection that includes everything from the weight and balance of the piece to the shape of the spoon bowls, the quality of the polishing, and more.